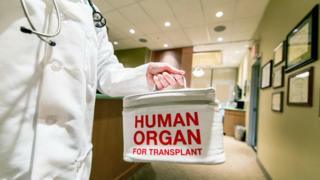 People in Northern Ireland are being asked to have their say on a new approach to organ donation. The Department of Health has launched a consultation on a draft policy designed to get families talking about donations. Transplant surgeon Dr Tim Brown said he hoped it would become "normal to donate your organs rather than something that people have to think about it". In Northern Ireland, 42% of people are on the NHS Organ Donor Register. The consultation has come about as a result of a failed bill in Stormont, which proposed that everyone should be on the register unless they opted out. Although the bill did not pass, it did give the NI Assembly a mandate to support organ donation. This system is already in place in Wales while England, Scotland and the Republic of Ireland are expected to follow suit. Image caption Dr Brown said Northern Ireland had a very "altruistic population"
Dr Brown told BBC News NI there were two strands to the draft policy - to explore and co-ordinate the ways charities, city councils and large corporate firms go about raising awareness. The other is aimed at improving the training for healthcare professionals. "About 40 to 50 people every year donate organs in the event of their passing," said Dr Brown. "In terms of living donation, we have one of the highest organ donation rates in the world. "We have a very altruistic population who have a very positive attitude to organ donation and we are hoping this will then carry over into the deceased donation field." Dr Paul Glover, who helped draft the policy, said: "What we are proposing for the first time is an ongoing funded programme of coordinated activities which we really believe can build upon the existing positive attitudes of people in Northern Ireland towards organ donation, and ultimately save and improve more lives." In the event of someone's death, families give final consent for organ donation to take place, and the Department of Health has a target of an 80% consent rate by 2020. "Families will always be asked to give their consent for donation to proceed, and will usually have the opportunity to speak with specially-trained healthcare professionals, however in around a third of cases consent is not given," a spokeswoman said. "Addressing the reasons for refusal and increasing the rate of family consent in these difficult and sensitive circumstances is one of the main aims of the policy." The consultation will last 12 weeks and the document can be viewed on the department's website. There will also be a series of public meetings early in 2018.